Troop PA-0019 has partnered with Giving Bean as a way to raise funds to reduce the cost of our outdoor adventures and to buy our camping equipment. Giving Bean is a local gourmet coffee roaster providing a variety of freshly roasted whole bean, ground, and k-cup coffees; fine loose leaf teas; gourmet cocoa; chai; and cookies. All coffee is roasted-to-order and arrives fresh, assuring great taste. Prices are $12-$14 per bag for coffee and tea, comparable to other high-quality coffees and tea. 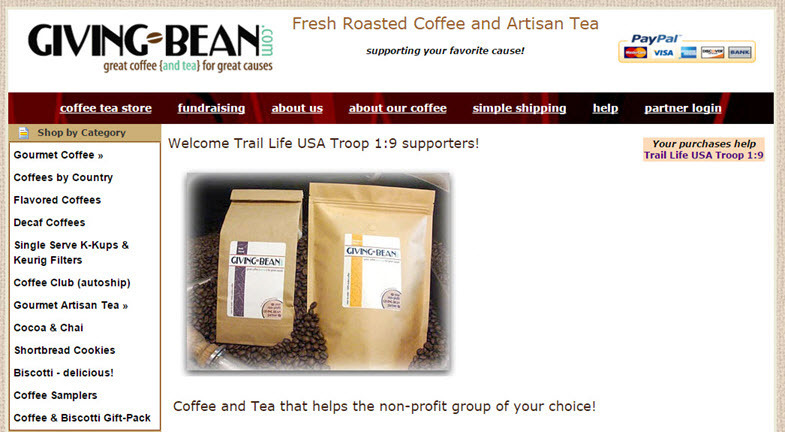 You can go to our Troop PA-0019 Giving Bean Fundraising Order Page and re-order at any time to support us all year long!